The day use area at Trail Bridge Reservoir near the old creek that comes down from Smith Reservoir is a fun place to practice your buoyancy skills in a forgiving environment. 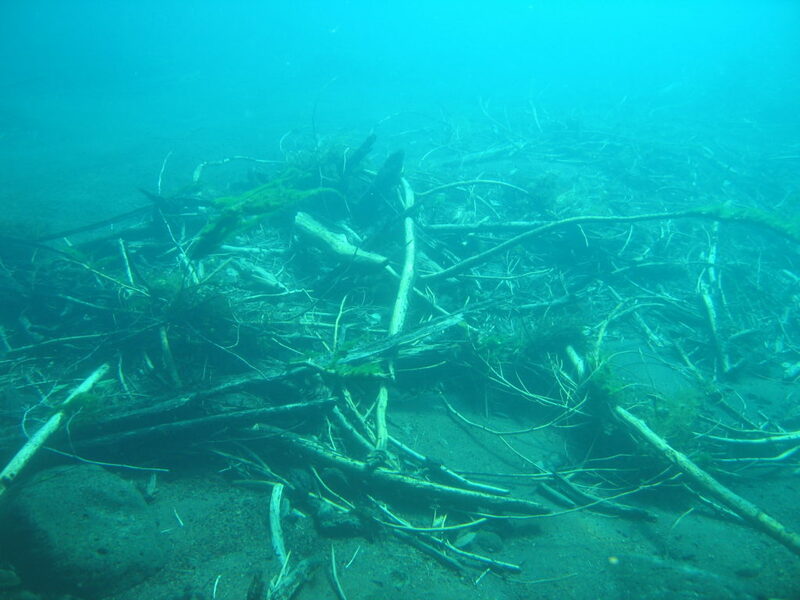 While most of the dive site is sand, there are a few submerged logs, and there is plentiful green algae common to the lakes along the McKenzie River. This is a fun spot to SCUBA dive with friends and take photos of one another. Entrance is easy from the parking area and the boat ramp. Practicing some neutral buoyancy skills at the south end of this dive site at Trail Bridge Reservoir. This SCUBA diving site doesn’t have much to look at like some of the nearby dive sites do, but what it lacks in interesting underwater features, it makes up for by providing a fun and forgiving place to practice neutral buoyancy skills that divers learn in peak performance buoyancy classes. If there is enough water flowing down from Smith Reservoir through the old creek, this can also be a little bit of a drift dive although usually the water flow is slow enough that there isn’t much current. There aren’t any towns close to this dive site. Eugene is over an hour away down the McKenzie River Highway. Rainbow is the closest small town that has gas and a convenience store. Most people will come from Eugene up the McKenzie River Highway (State Highway 126). The left turn onto the forest access road (National Forest Road 730) is a bit tricky. Be sure to put your blinker on early and slow down with plenty of time. There is plentiful parking at this site. Don’t block boat trailer parking. Check at the information kiosk to verify that day use parking is still free. The last time we went diving at this site, it was. This dive site at Trail Bridge Reservoir is a good place to practice your neutral buoyancy skills. The creek is roughly on a north-south orientation. You can’t get lost in the creek because the channel is narrow and the current goes to the south. Once you pass the boat ramp heading south, the channel continues on into deeper water. There are several entrances and exits that are an easy walk to get into the water. The boat ramp is the easiest entry but the others are very easy, too. The water level in Trail Bridge Reservoir can change quite a bit throughout the day. We’ve seen swings of up to 7 feet from morning to afternoon. Water levels depend on what the Eugene Water and Electricity Board is doing with the hydro projects up and down the river. 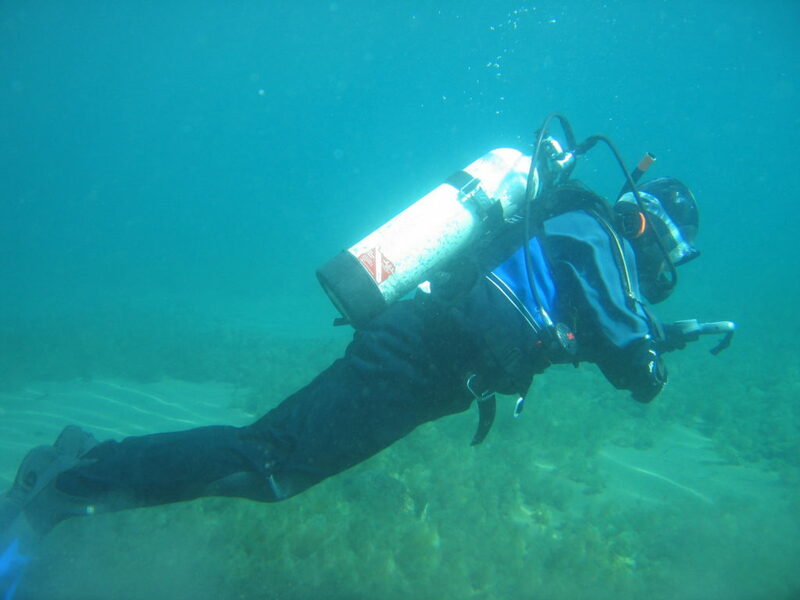 Visibility is usually 10-20 feet at this SCUBA dive site. For Oregon, that’s pretty good. In the spring, runoff from the area drained by the creek can decrease visibility, especially if logging is occurring upstream. The silt on the bottom is pretty easy to stir up. This makes for a good place to practice your buoyancy skills. We have seen water temperatures in the upper reaches of the creek down to 35F when the snow is melting and down near the boat ramp up to 55F during the summer. Usually the water is about 45F. A collection of tree limbs in the sunken creek. There are a few fallen trees that stick out into the creek as well. We prefer this dive site either in the spring or fall when there is enough runoff to make a little current in the creek. The site is inaccessible in the winter due to snow. 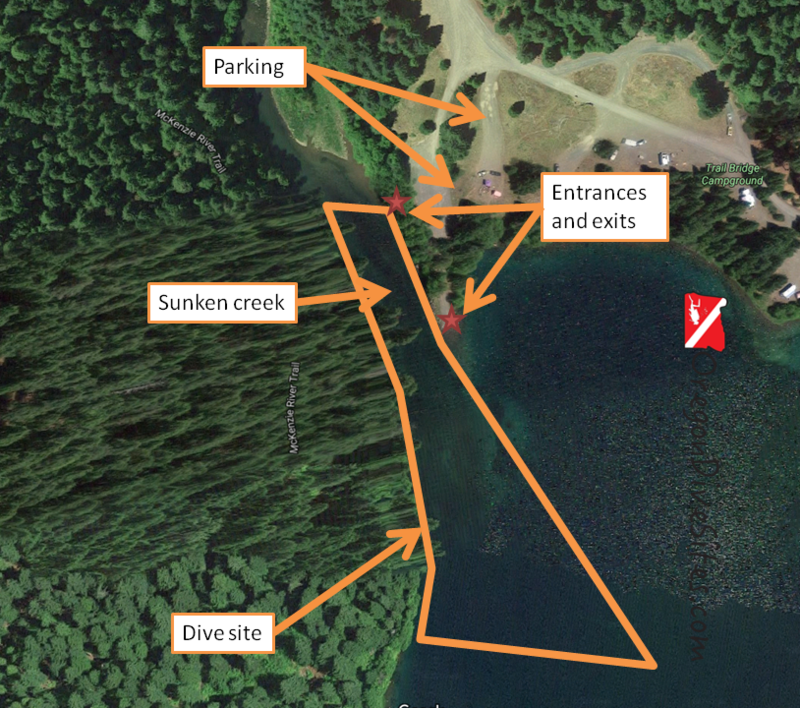 In the summer, it can be busy by the boat ramp but is still diveable. At the extreme southern end of this dive site, you can sometimes hit 40 feet. In the creek, you are around 10-15 feet. This is an altitude dive because Trail Bridge Reservoir is at 2,000 feet above sea level. Make sure you have altitude diver training. Otherwise, this site can be enjoyed by just-certified open water divers up to very seasoned divers with hundreds of dives under their weight belts. The dive is very easy although those who have not practiced their buoyancy skills much will find the shallow depth to be a good challenge. Depending on where you park, 20 feet up to 200 feet. The walk is easy, level, and mostly graveled. There is no surface swimming here unless you want to. The water level in Trail Bridge Reservoir can change rapidly and without warning. We have seen swings of up to 7 feet in a day. The dam beyond the southern boundary of this dive site should be avoided. You don’t want to get sucked into the machinery and end up as finely diced SCUBA diver fish food. Motorboats do use the lake and are launched from the boat ramp at the east side of this dive site. A good diver flag on a reel will help you to stay safe. We have one that we highly recommend on our Gear We Use page. There are no close dive shops here. The shops in Springfield and Eugene are the closest. You must be self-sufficient to dive this site. There is limited hot food service at the resort up the road at Clear Lake. Otherwise there are restaurants in Marion Forks and Rainbow, each over 30 minutes away. The cabins at the resort at Clear Lake are an option. Be sure to ask the staff what you should do with your dive gear and don’t go against their wishes. We want SCUBA divers to still be welcomed at the cabins! There is ample camping around Trail Bridge Reservoir. There are additional improved campgrounds at Clear Lake up the road and up the National Forest road at Smith Reservoir. You can also do primitive camping in the National Forest but be sure to check at the local ranger station about any seasonal restrictions or fire danger closures.